In July of 2011, Ankur Srivastava, associate professor in the Electrical and Computer Engineering Department and the Institute for Systems Research, received an appointment to the Association for Computing Machinery (ACM) Distinguished Speaker Panel. This designation provides a platform from which Dr. Srivastava can share his research and ideas with professional organizations, peer institutions, and many others who are seeking speakers in particular topic areas. One advantage of earning this recognition is that Dr. Srivastava will be sought after as an expert in his field, often being offered the opportunity to share ideas and research with new and unique audiences. ACM Distingushed Speakers are appointed after completing a stringent selection process. 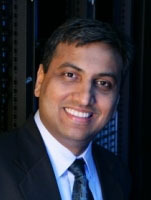 In recognition of his research and experience Dr. Srivastava will be speaking most often in the broad subject fields of Design Automation and Computer Systems. These topics will highlight his interests in VLSI, design automation, and high performance computing. Speaking as a member of this circuit will expose Dr. Srivastava’s research to his peers and other industry professionals serving as a vehicle for information and idea sharing, while helping to publicize the strong research program within the Department of Electrical and Computer Engineering.